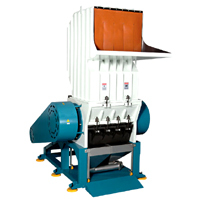 Shredding Machine - Wide bore Shredder(JM Series) - Sinchung(Jachen) Technology Co., Ltd. This series is used to crush plastic or rubber items into flakes, e.g. PVC pipes, PET bottles, PP flats, rubber pipes, plastic syringes, CDs, PCBs, PE boxes, waste injection products, waste extruder products... And the flake size can be adjusted by seive size. All in All, we can customized it to meet your every specific need.